The wonderful NCCC Gold Seven team have been working at HREC for the past 3 weeks, they have been so helpful - all the HREC staff will be so very sad to see them go! In this blog post we learn a little about the team members and get an overview of the work that they have been involved in, the interviews were conducted by Hannah Wood, the media lead for the team. 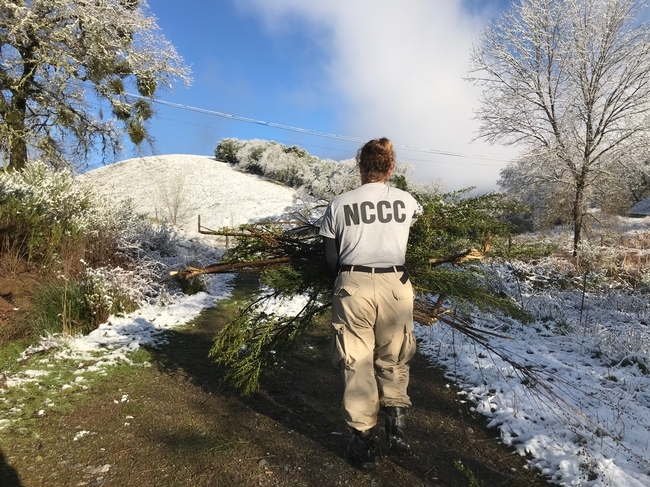 As the AmeriCorps NCCC team stationed at the UC ANR Hopland Research and Extension Center, we've had plenty of projects to keep us busy! In the three weeks we've been volunteering here, we've helped repair fence lines previously burnt in the River Fire, were put in charge of some daily barn chores, helped build infrastructure for upcoming research projects, assisted with K-12 educational programs, cleared brush, helped tidy up the place, and sometimes worked closely with the sheep (tagging, paint branding, raising bummer lambs, and giving vaccines). 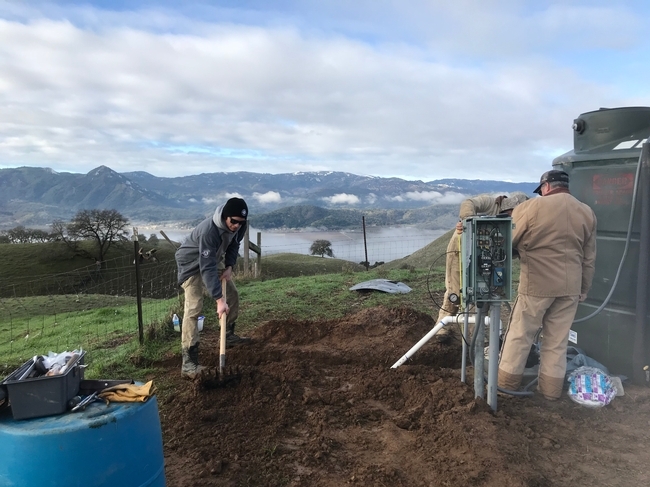 Although the work was daunting at times, and the weather was never perfect, we were thankful to be working and living on this beautiful property right alongside the welcoming staff and their families. We learned loads of information about California seasons and climates, lambing, the important research projects going on, Northern California ecosystems, wildlife in the area, and wildfire mitigation and recovery. And the baby lambs made our days brighter… even with rainy skies! 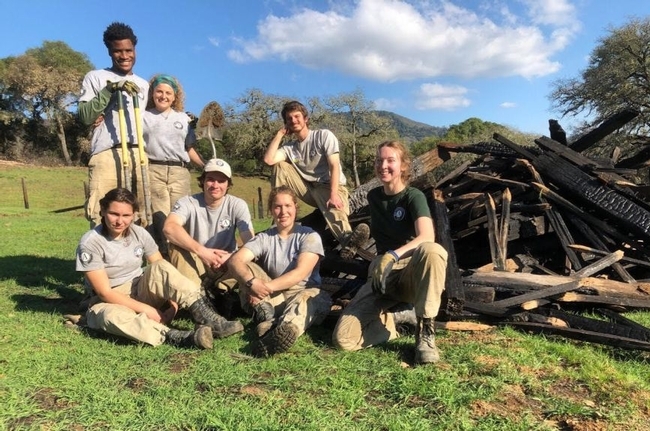 I've asked a few of my fellow Corps members some questions about their personal experiences at the UC ANR Hopland Research and Extension Center… and here's what they said! Q: What was your favorite part of volunteering at HREC? I enjoyed learning a ton from the very knowledgeable HREC staff. Their welcoming attitude enabled us to get a firsthand experience of what living and working at a research extension center entails. We worked with each and every person on staff and they all showed us the details and unique experiences of their work duties, while also being very open and friendly toward us. Q: What has made your experience at HREC? I liked getting insight into the life of a shepherd and seeing the day to day responsibilities of working on a ranch. I also really enjoyed learning about all the research projects! Overall my time here has been extremely educational and useful for developing myself and my interests, specifically when working with the Forest Advisor for Mendocino Lake and Sonoma counties on post fire vegetation plot surveys. Q: What's it like living at the HREC? Q: What was it like as the Team Leader coordinating daily projects with the staff?  The staff at HREC are all incredibly helpful and organized so I had a really great experience working with them. I never had trouble getting into contact with anyone and every member of the staff was happy to answer questions. The team got to work with a number of staff members who all had diverse bodies of knowledge and we learned a lot from them! Working at HREC has been a wonderful experience for me and for the team. Q: What was it like volunteering on the weekends with the Ukiah Animal Shelter? It was really rewarding! It was good to see that none of the animals we worked with before Christmas break were still there when we returned in January. I'm glad we got a chance to help out and I would love to do more work with animal shelters in the places we'll work at in the future. Q: How was it working with the K-12th graders that came to HREC to learn about sheep? Working with the school children was a great experience. 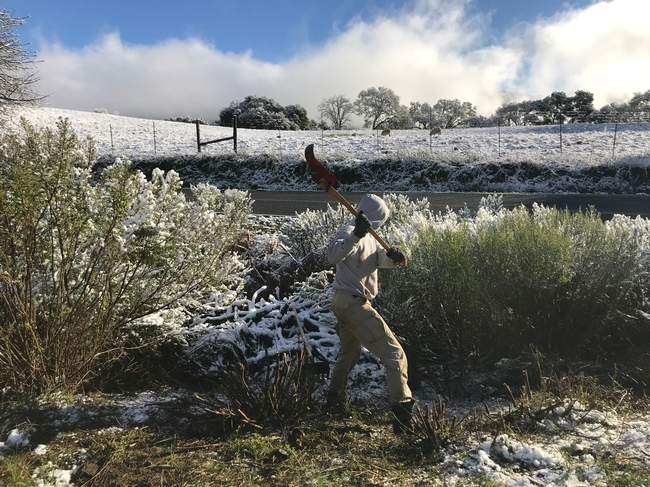 The weather was cold and wet a lot of the days we did field trips but the teachers and students were enthusiastic to hike the property, which in turn, energized the staff and volunteers! 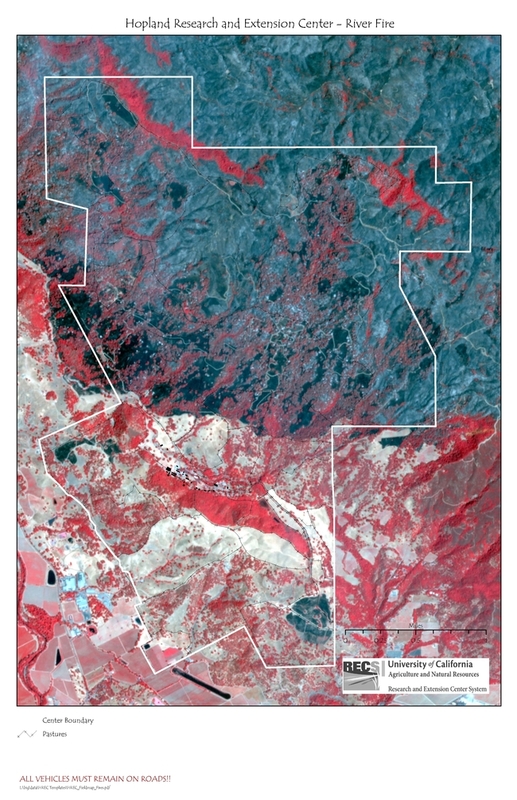 Q: Anything you'd like to say to the HREC and Hopland/Ukiah communities? HREC's hospitality was great. The entire staff was welcoming and helpful, the dorms are nice and cozy, the land is beautiful, and it is a great place to hike... or just roam. Thank you HREC staff! 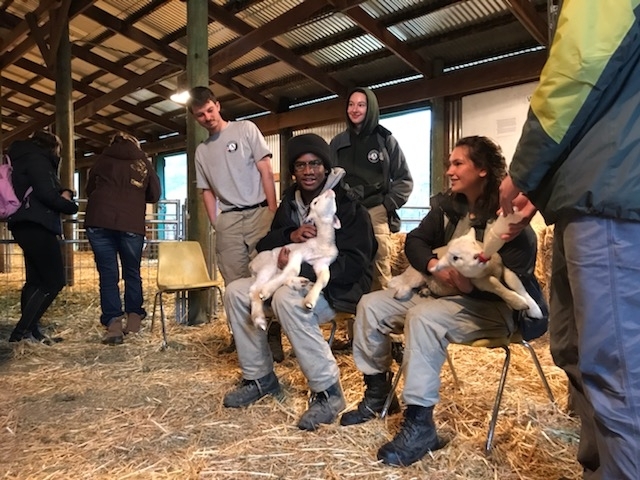 Amir and Alex show the "bummer" or adopted lambs to the K-12 students. Hard work on the hill! All the Americorps Gold Seven team worked so hard rain, snow or shine! Clearing brush, to be prepared for future fire was one of the key tasks that the team helped HREC with.